This easy gluten-free french toast is paired with the perfect strawberry sauce for a delicious breakfast or brunch! Are you team sweet or savory for breakfast? Most mornings, I crave something savory for breakfast. Bacon and eggs, veggies, and avocado toast are all some of my favorites. But some mornings, you just want a sweet decadent breakfast or brunch. 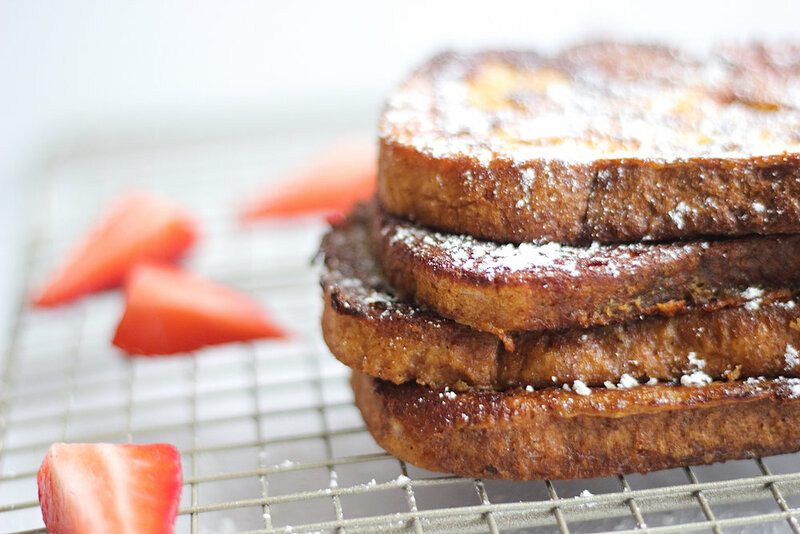 French toast is perfect for those lazy a Saturday morning breakfast or Sunday brunch. If you're looking for a sweet treat to surprise your honey on Valentine's Day, this Strawberry French Toast is so easy and a sure-fire way to impress them. French toast can seem a little complicated on the surface, but it's honestly one of the easiest breakfast treats that you can make. All you have to do is make a simple batter, dip your bread, and fry it up in a little oil or ghee. French toast is also great use of bread that's a bit dry or starting to get to stale. The drier your bread, the more delicious batter it can soak up which makes it even better. This recipe uses gluten-free bread to keep things gluten-free and still delicious. It's crispy on the outside, tender on the inside and just perfect. The best part? French toast reheats really well, so if you have a few leftover pieces just pop them in the oven or a toaster oven to reheat! This Strawberry French Toast uses full-fat coconut milk instead of traditional milk to make a rich creamy batter. Coconut sugar or brown sugar gives the French toast a sweet caramelized crust and the cinnamon and vanilla give it that classic delicious French Toast flavor. You finish things off with an easy strawberry sauce that mades with fresh strawberries, vanilla, honey, and squeeze of fresh lemon juice. Topping the French toast with the simple strawberry sauce really takes it to the next level! Of course, the final touch is a drizzle of pure maple syrup over everything. So delicious! Add coconut oil to a griddle or large skillet and melt over medium heat. Dip the bread into the egg mixture. I like to let each piece soak for a minute or two. Fry the slices until golden brown, flipping once. Serve with maple syrup, strawberry sauce, and whipped coconut cream. Enjoy! Place the strawberries, honey, and vanilla in a sauce pan. Cook over medium-high heat, stirring occasionally as it simmers. Mash a few strawberries with a wooden spoon or heat-proof spatula while it's cooking to help produce the syrup. Cook until the sauce thickens about 10-15 minutes. Remove from heat and finish the sauce with a squeeze of lemon juice. Serve warm. All the Healthy Things is more than just a blog, it's a community of people who want to live their healthiest happiest lives. Subscribe to receive the latest recipes and resources!